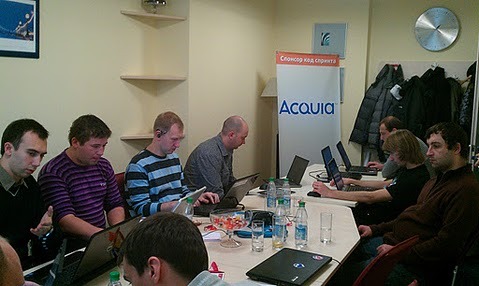 Last weekends we held great drupal event -- DrupalCamp Donetsk 2011. This is one of the places of next year UEFA EURO 2012 and it was really great place for our meetup. About 170 attendees have arrived and were around during 20 sessions. It is very interesting that more and more new companies in Ukraine start developing using drupal and shows huge interest in local meetups. We had people from different cities of Ukraine and even several people from Russia and Belarus. We have had beautiful bar party as well. Rock group in one of the bars were playing couple of drupal songs that made huge success! As I was one of organizers of the codesprint, I would like to share our experience about it. We didn't have super rockstar developers at our codesprint but managed to do very nice job -- rewrite module draggableviews. There are plenty of very good developers in Ukraine but it is a pity that not many people understand importance of the contributing. So we started from ground level of using issues queue and creating patches and finished with workable code. We had several teams (every team not more than 6 people) who were working on different topics: draggableviews, couple views issues, porting api.drupal.ru to drupal 7, setting up development environment (for beginners). In this way we were able to attract new people to contributions but keeping our concentration for the final result. I would like to thank all our sponsors and hope to see more people comming to Ukraine for drupal events! Superb work!, I'm curious on how many people did you get in the codesprint vs sessions, anyways, getting something commited out of a codesprint is always great news! We had codesprint on third day that we didn't have any sessions. I think we had about 17-20 people total on the codesprint. That was my aim to have commit for every person who participated to attract them to come. So this may be good way reward participants. Nice to hear. I'm very curious and I'd eager to see what's the result of your work. Keep up with posting as soon as you got it ready.